Regarding the endless and heartfelt California wildfires with resultant calamities, 2018, monetary efforts to help displaced and wounded animals has been arranged through the NCPA (Northern California Publishers & Authors organization). As one of many author members of this organization, I am happy and grateful to participate in this multi-author book-signing fundraiser in the FieldHaven Marketplace, 454 F Street, Lincoln, California on Saturday, November, 24, 2018 from 11 am to 3 pm. This will assist the FieldHaven Center with their ongoing rescue efforts and medical care of numerous animals affected by the Northern California wildfires. 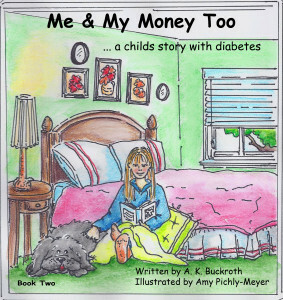 “Me & My Money…a child’s story of diabetes,” written by A. K. Buckroth, illustrated by Amy Pichly-Meyer. 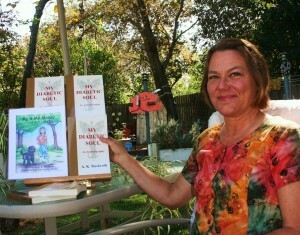 “Me & My Monet Too…a child’s story with diabetes, Book Two” written by A. K. Buckroth, illustrated by Amy Pichly-Meyer. 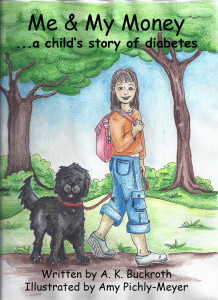 “Kisses for Cash, Kali’s story…T1D meets T2D, Book Three,” written and illustrated by A. K. Buckroth. This series begins with Kali, an eight-year old T1D (Type One Diabetic). Diagnosed with this disease at the age of two, she firmly believes she knows everything about this disease. Until she decides to use her saved-up allowance to adopt a puppy, her responsibilities grow! Appropriately naming the puppy Money, they become beloved friends. Then something huge happens! Through Kali’s knowledge of this disease, she has suspicions – suspicions that turn out right…Money is diagnosed with diabetes! In Book Two, Kali, now ten years old, comes across more personal challenges and responsibilities that expand her knowledge of her and Money’s diabetes. Courage continues with school, friends, projects, adventures, and necessary social adjustments. Book Three introduces us to one of Money’s great adventures and what he finds in the nearby river. Quite riveting. Can you imagine what that could be? That’s not all, oh no. For one thing, Kali’s Grandmother, a T2D, comes to live with Kali and her parents. Surprise, surprise, surprise! Can you guess what Grandma does? Well, this is where Cash comes to play. As this particular Saturday has become known as “Small Business Saturday,” hopefully that will help with attendance. For more information, contact the NCPA – www.norcalpa.org. This event is about giving and helping innocent animals in their time of need. ML Hamilton, President NCPA; Denise Lee Branco, author and event coordinator; A. K. Buckroth, author & participant.